The Chiang Mai University Research Institute for Health Sciences (CMU-RIHES) was established in 1967 and formally constituted in 1978 as part of Chiang Mai University (CMU), a public university chartered by Act of Parliament under the jurisdiction of the Ministry of Education, Royal Thai Government. Its initial research focus was malnutrition, but since 1988, HIV/AIDS has been a major focus. Through a longstanding collaboration with Johns Hopkins University (JHU) and support from the Rockefeller Foundation, the Walter Reed Army Institute of Research, and the U.S. NIH, CMU-RIHES researchers have been able to acquire the training, facilities, and equipment to make it one of NIH’s strongest overseas research sites for prevention and treatment in HIV/AIDS. In 2005, NIAID announced recompetition for Clinical Trial Units (CTUs) and Clinical Research Sites (CRSs). CMU-RIHES was awarded for 7-year grant (February 2007 to November 2013) to establish the Chiang Mai University HIV/AIDS Clinical Trials Unit (CMU HIV/AIDS CTU), with 3 Clinical Research Sites (CRSs) affiliated with the newly-awarded leadership groups HVTN, ACTG, and the IMPAACT (International Maternal Pediatric Adolescent AIDS Clinical Trial group), respectively (grant number: UM1AI069399, PI: Thira Sirisanthana, funded from 2/2007 through 1/2014). CMU-RIHES collaborators at JHU were also awarded a grant to set up the South Asian HIV Prevention CTU (grant number: UM1 AI 069406, PI: David Celentano, period 1/2007 – 12/ 2013), for which the prevention study section at CMU-RIHES was its sole CRS (named the CMU HIV/AIDS Prevention CRS, CRS leader: Suwat Chariyalertsak), affiliated with HPTN. 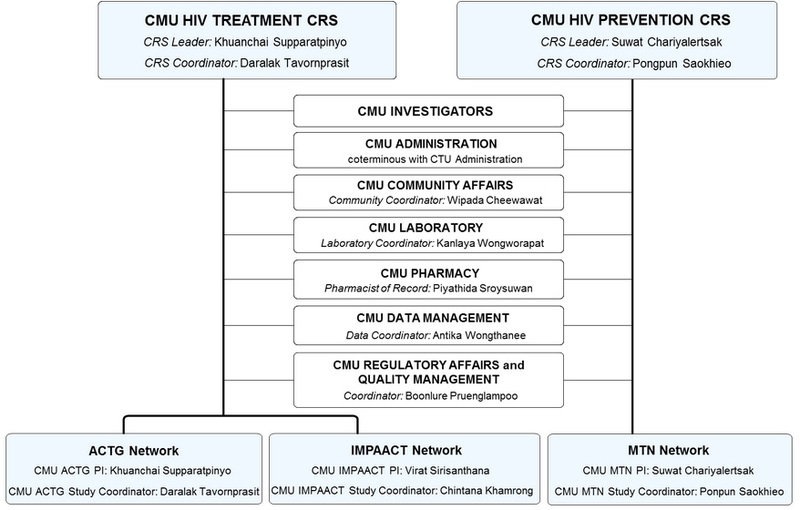 In 2010, CMU-RIHES (as site number 613-009, local PI: Khuanchai Supparatpinyo) started enrollment into the Strategic Timing of Antiretroviral Treatment (START) study of the International Network for Strategic Initiatives in Global HIV Trials (INSIGHT). Then in February 2013, the CMU CTU was awarded a fourth CRS, called the PIMAN CRS (CRS Leader: Suwat Chariyalertsak) which affiliated with the Microbicide Trials Network (MTN). Since 2007, the CMU HIV/AIDS CTU by its 4 CRSs implemented >30 NIH-funded HIV research protocols for ACTG, HPTN, HVTN, IMPAACT, INSIGHT, and MTN networks, as well as dozens with other support (e.g, iPrEx, MHRP, CDC, etc.). In 2013, NIAID announced recompetition/renewal for Clinical Trial Units (CTUs) and ClinicalResearch Sites (CRSs). In this round, CMU-RIHES expanded its CTU by adding the anotherlarge, respected, and prolific institution for HIV research: the Thai Red Cross AIDS ResearchCentre (TRC-ARC), affiliated with Chulalongkorn University. From this CTU expansion, theCMU HIV/AIDS CTU was renamed to “Thailand HIV/AIDS and Infectious Disease ClinicalTrials Unit (THAI CTU)”, led by Co-PIs Suwat Chariyalertsak, Director of CMU-RIHES, andKiat Ruxrungtham, TRC-ARC Deputy Director, and Director of its labs for clinical research andimmunology. THAI CTU, with its three CRSs, successfully competed the recompetition/renewal process and was awarded byDecember 2013 to November 2020. THAI CTU is one of 37 NIAID-funded CTUs around the world to conduct clinical research onHIV treatment and prevention from December 2013 to November 2020. There are only 11stand-alone CTUs outside the US and only 2 CTUs in Asia. Our 3 CRSs are among 109 CRSs around the world. There are only 8 CRSs in Asia and only 4CRSs in Thailand. THAI CTU encompasses three Clinical Research Sites (CRSs), two at its Chiang Mai campus(CMU HIV Treatment CRS  and CMU Prevention CRS ) and one at its Bangkokcampus (TRC-ARC Treatment CRS ). THAI CTU, despite of having 2 physical locations in Chiang Mai and Bangkok, consolidates itsoperations using common core administrative and coordinator teams. These administrative andcoordinator teams comprises of key members (coordinators) from both institutes as shown inthe organization chart below. CMU HIV Treatment CRS (site number 31784), conducting NIAID-funded clinical research on treatment of HIV/AIDS and HIV-associated conditions in adults (under ACTG) and in children and mothers (under IMPAACT). CMU Prevention CRS (site number 31458), conducting NIAID-funded clinical research on the use of microbicides to prevent HIV infection (under MTN). Despite of having 2 CRSs and conducting clinical research under 3 Clinical Research Networks, CMU-RIHES consolidates its operations using common core administrative and research supporting teams as shown in the organization chart below.